Continuum is one of Microsoft's signature features in Windows 10 where the user interface can adapt automatically depending on the situation. For example, on a Surface Pro 3, Windows 10 will default to desktop mode with the keyboard attached and will then switch to tablet mode when you remove it. Continuum will also be present in Windows 10 Mobile allowing your smartphone to attach to a monitor, mouse and keyboard, wired through the use of accessories or wireless through Bluetooth and Miracast. It will then project a desktop like app experience to the monitor using the apps on your phone. "Windows 10 adjusts your experience for your activity, device and display, so you can do your thing in any mode anytime you want. Onscreen features, like menus and task bars, adapt for easy navigation. Apps are built to scale smoothly from screen to screen so they look good from the smallest app window up to the largest 8k displays. You can even change from desktop to tablet mode anytime you want – your screen will give you a smooth transition and a beautiful display. Available exclusively on Windows, Continuum is designed to ensure that the best screen is always the one you're on." 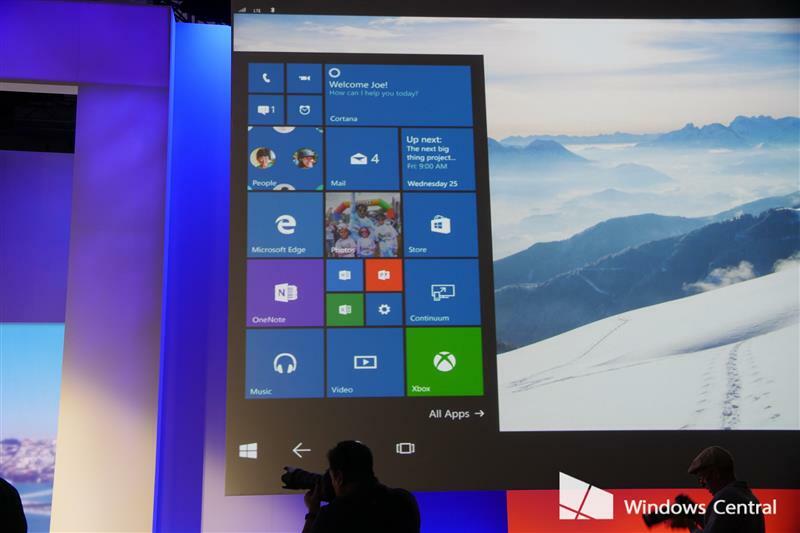 Continuum for Windows 10 is available to use now and will come to market with Windows 10 Mobile later in 2015. On phones, however, it will require new hardware, so existing phones won't support it. It requires the power to drive dual displays, something not present in current Windows Phones. Microsoft built a monster of a handset so that it could test Windows Phone builds. Here's what it looks like! Samsung's second generation Continuum-alike for the Galaxy S9 is better than last year, but it's still not as good as the system HP built for the Elite x3 back in 2016. Is Continuum for phones dead? In its current form, yes ... but that doesn't mean it won't show up again in the future. What is the status of Microsoft's iTunes and what is happening to Continuum now that Windows 10 Mobile is dead? Let's talk about it! Tunes into this week's episode of #AskDanWindows. Do you think Windows Continuum is a failure? Microsoft hasn't done much with Continuum since it was announced. Is it another Microsoft failure? If you’re looking to do a little binge streaming over Continuum, Netflix can now help with that — so long as you're using Edge. Here's a closer, more in-depth look at Microsoft's new Continuum experience powered by CShell, showcasing all the new enhancements that are currently in works. We have exclusive screenshots and video of Microsoft's upcoming "CShell" adaptive UI for Windows 10! Microsoft said Windows 10 S is the Windows we all know. There's one major difference, however, that could be problematic for consumers and a real PR issue for Microsoft. With Samsung's announcement of Galaxy S8 smartphone and the new 'DeX' functionality, Microsoft has a new Continuum competitor. Dex looks impressive, but Samsung still faces obstacles. Here's why. HP is working on a second generation of its Lap Dock Continuum extender, and it improves upon some things over the first generation. Your car dashboard may not be the first (nor safest) place you imagined taking Windows 10 Mobile’s Continuum feature, but a concept car for German police does just that. Surface's success was critical to Microsoft's hardware/software personal computing vision. Failure was't an option. I plugged my L950 in to a dell display dock, which runs on USB-C, and continuum worked, the only way to tell is if you have a USB-C laptop with the capabilities of expanding, then give it a go.